1. Find local stories in national data. National data in stories from wire services or large dailies usually includes regional numbers. Find things like wage data for your city and use it as the basis of a news or feature story. Compare the data with that of past years and figure out what it means for the local economy. Named for the color of its cover, the “Beige Book” is regularly released by the Fed and provides an up-to date qualitative account of what’s happening in each of its 12 districts. Take what you learn and talk to local business associations and lenders about market conditions. You can even compare conditions with other districts. 3. Don’t forget preview stories. When anticipating the release of new data figures, seek out comment from local experts on what they’re expecting. What do they think the numbers will mean for the area you cover? It’s also a great opportunity to explain why there is so much anticipation for a specific set of data like CPI, GDP, etc. 4. Find what goes against the flow. Looking for angles that go against national data trends can lead to strong local stories. When the economy takes a turn for the worse, what businesses around town are surviving or actually thriving? Is it something unique or does it say something about the characteristics of your coverage area? 5. Develop your technical skills. There’s more than enough information in media releases, but don’t just rely on what experts say. Keep your own up-to-date database and play around with figures. Compare recent data with data you collected in the past. Look for trends and ask experts to comment on what you find. This way, you’ll avoid producing simple, repetitive stories. Want more? 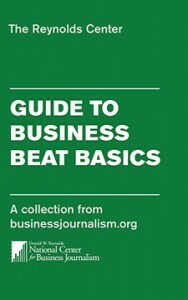 Download our “Guide to Business Beat Basics” for tips on covering money in the economy and other beats.